Thank you to everyone who sent in updated Bird scooter rates last week! Lime and Uber have apparently followed suit. Please keep ’em coming, we’ll do something with the new scooter rates soon. Personal Mobility. “Personal Mobility refers to our offering that includes our Ridesharing and New Mobility products.” Less jargon: ride hail, electric bikes, and electric scooters. Uber’s primary business. New Mobility. “New Mobility refers to products in our Personal Mobility offering that provide consumers with access to rides through a variety of modes, including dockless e-bikes and e-scooters.” Less jargon: e-bikes and e-scooters, a subset of personal mobility. Core Platform Adjusted Net Revenue. “We define Core Platform Adjusted Net Revenue as Core Platform revenue (i) less excess Driver incentives, (ii) less Driver referrals, (iii) excluding the impact of legal, tax, and regulatory reserves and settlements recorded as contra-revenue, and (iv) excluding the impact of our 2018 Divested Operations.” Less jargon: Uber’s revenue from rides and Eats, minus most driver promotions and some other technical costs. 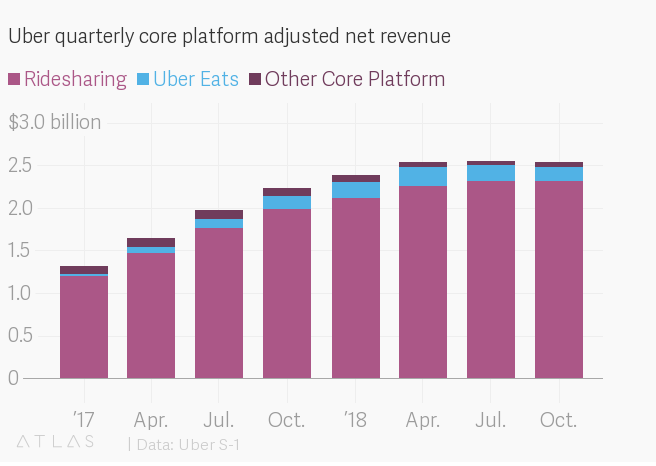 Uber thinks this is a good measure of its net revenue from rides and Eats. Excess Driver incentives. “Excess Driver incentives refer to cumulative payments, including incentives but excluding Driver referrals, to a Driver that exceed the cumulative revenue that we recognize from a Driver with no future guarantee of additional revenue.” Less jargon: When Uber pays a driver more than the rider pays to Uber. Nearly 13% of global gross bookings are paid in cash. Fifteen percent of gross bookings come from rides that start or end at an airport. Drivers have earned more than $78.2 billion since 2015, plus $1.2 billion in tips since July 2017. A solid C- to whoever made the charts in Uber’s S-1. Poor grayscale, low image quality, fuzzy numbers. Charts like these give data editors heart attacks! I redid some of them in Quartz’s Atlas charting platform (feel free to use it next time, guys). 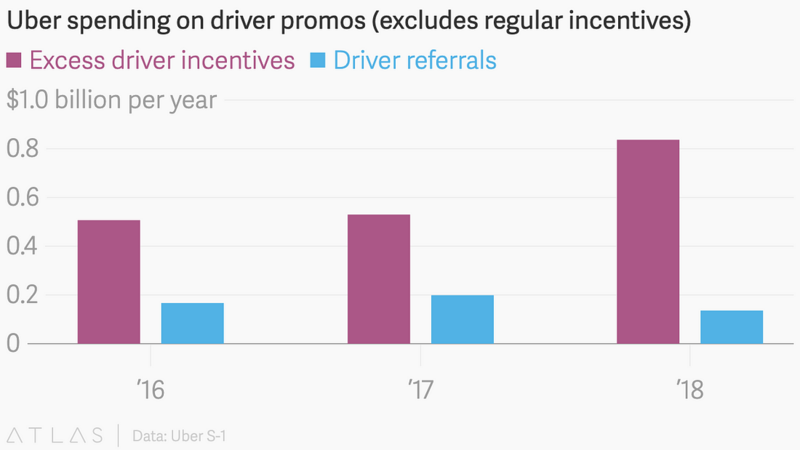 Excess driver incentives and driver referrals, but not plain old driver incentives, which Uber doesn’t actually break out in its cost of revenue. Uber’s game plan is to be big. “Our strategy is to create the largest network in each market so that we can have the greatest liquidity network effect, which we believe leads to a margin advantage.” There are undoubtedly benefits to being the biggest player in a logistics space. More drivers and riders gives Uber more options for pairing them up, helping it keep driver utilization high and rider wait times low. The same goes for food delivery, which, as Uber points out, is also a way to give drivers additional work when the rides platform slows. 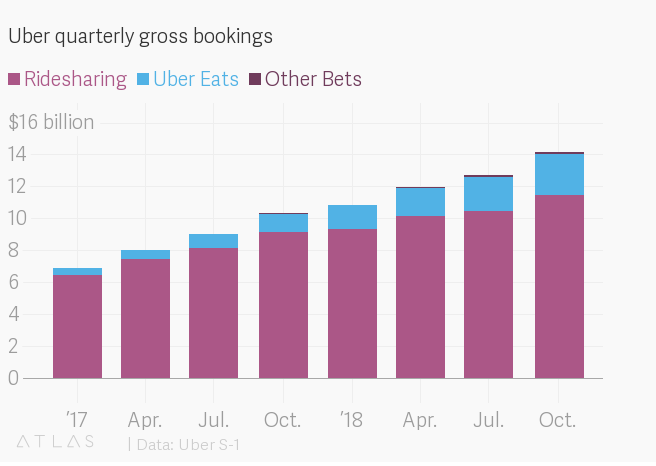 Less clear is whether being big alone can sustain Uber or help it turn a profit, especially amid intense competition in just about every market. Uber can’t quit incentives. “To remain competitive in certain markets and generate network scale and liquidity, we have in the past lowered, and expect in the future to continue to lower, fares or service fees, and we have offered and expect to continue to offer significant Driver incentives and consumer discounts and promotions.” And: “Many of our competitors are well-capitalized and offer discounted services, Driver incentives, consumer discounts and promotions, innovative products and offerings, and alternative pricing models, which may be more attractive to consumers than those that we offer.” Uber is spending significant amounts of money on freebies: cheap fares, higher driver wages, bonuses, referrals, and so on. Not all of these are detailed explicitly in its filing, but they are discussed a lot. As I’ve said before, the danger of the subsidy model is that when you sell something below cost for a long time, it starts to become unclear whether a critical mass of your users will continue to want that thing at its actual price. Driverless cars are far from a sure bet. “We may fail to develop and successfully commercialize autonomous vehicle technologies and expect that our competitors will develop such technologies before us…”. And: “Waymo has already introduced a commercialized ridehailing fleet of autonomous vehicles, and it is possible that our other competitors could introduce autonomous vehicle offerings earlier than we will.” Uber spent $451 million on R&D specifically related to its Advanced Technologies Group in 2018, up from $377 million in 2017. The company also just raised $1 billion for that unit from investors including Softbank and Toyota, valuing it independently at $7.25 billion. At Uber’s current pace of spending, that money could be gone in two years, though it seems unlikely the company will have a fleet of passenger-ferrying driverless vehicles to show for it. Competition is tough. In the US there is Lyft, in the rest of the world, there is everyone else. Uber also revealed a unique handicap in its IPO filing. Minority ownership stakes restrict Uber from competing with Didi Chuxing in China, Yandex.Taxi in Russia/CIS, and Grab in Southeast Asia for another four to six years, but don’t restrict those companies from competing with Uber anywhere in the world. Didi, for example, competes with Uber in Latin America and in January 2018 acquired Brazil’s 99, another Uber competitor. Send your favorite S-1 observations to me at oversharingstuff@gmail.com. Send tips, comments, and thoughts on Uber’s S-1 to @alisongriswold on Twitter, or oversharingstuff@gmail.com.